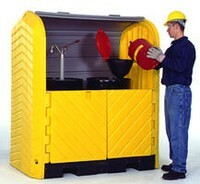 Store hazardous drums safely outdoors with pumps and funnels in place, Tall 2-3/4" head space easily accommodates rotary drum pumps and large conical funnels, Low profile (8-3/4") containment pallet positions drum-top funnels at safe, convenient level to pour hazardous wastes. 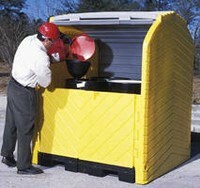 Roll-top covers can be easily lifted from waist height to access drum tops -- no need to reach near ground level. Forkliftable, lockable, all polyethylene construction, will not rust or corrode.